On behalf of LoadRite Canada, we’d like to say Happy New Year! We had a pretty great 2018 at our Monkland or Innisfil boat trailer yards, selling large and small boat trailers alike. We love it when people stop by and talk about their boats, the type of trailer they need, and their boating plans for the future. If you’re like many people, you’ve made some New Year’s resolutions. And while “boat trailers” might not be on your mind on New Year’s Eve, you can certainly make resolutions about your 2019 boat at any time. So when the party is over and your mind starts to drift to spring, what kind of resolutions can you make about boating? Let’s take a look. There are many types of boaters out there. There are the kinds who seem to spend more time washing and drying their boat than actually putting it in the water. Then there are the kinds that seem intent on letting it get as beat up as possible, those who are just looking for an excuse to buy a new one! We’d suggest being somewhere in the middle. Yes, you need to take care of your boat and your boat trailer, but you also want to get out there and use it as much as possible. You should take care of it, but you don’t want to be worshipful to it either. On the other hand, you should perform basic maintenance (on the boat and on the trailer) so that you’re not caught out in the middle of the lake, unable to move. Even if you’re vying for a new boat and a larger boat trailer, you’ll want to get the best trade-in price for what you have now. Why do you have a boat? For some people, it’s so that they can get to their favorite fishing spots. For others, they just want to enjoy the feeling of being out on the water. Still others are out there whipping around and pulling water skiers and tubers around. You own a boat because you want to do something that makes you happy. So why not get out and make yourself happier more often? While it’s important to get your work done, it’s also important to make time for this important self-care. If you’re the kind of person who uses their boat in order to get away from it all, we understand. But boating can also be a fun experience for other people, and you should probably share! If you usually go out alone, change things up a bit and bring a family member. If you usually go out with the family, invite some friends along too. After all, a beach hot dog roast is just as good a place as any to have that get-together with friends. And to be honest, your friends want you to invite them out on your boat! We get it…if you already wear a life vest every time you go boating, you don’t need to hear this. If you don’t wear a life vest, you’re sick of people telling you to do it. Too many people use the excuse “I can swim, I’ll be fine.” But there are many emergency situations when you might not be conscious to swim, or when having a life vest can give you the added buoyancy to help someone else back to the boat. Wearing a life vest makes sense more times than it doesn’t. At the very least, you should wear a life vest as a good example for those around you. If you don’t wear a life vest but tell kids that they have to, then they’re going to abandon them in the future when they’re on a boat and you’re not around. Now is the perfect time to instill in them the idea that life vests are important. Happy New Year From LoadRite Boat Trailers! It might still be cold out there, but we hope you have a great 2019 when the lakes thaw out. 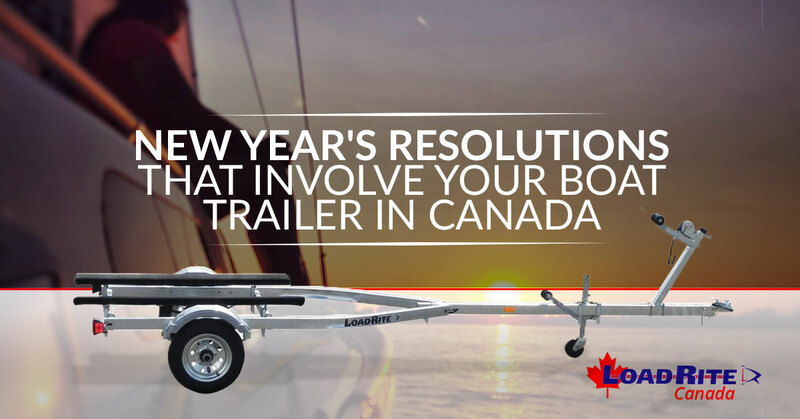 And if you’re in need of a new boat trailer in Canada, LoadRite is there for you. Check out our hours right here!